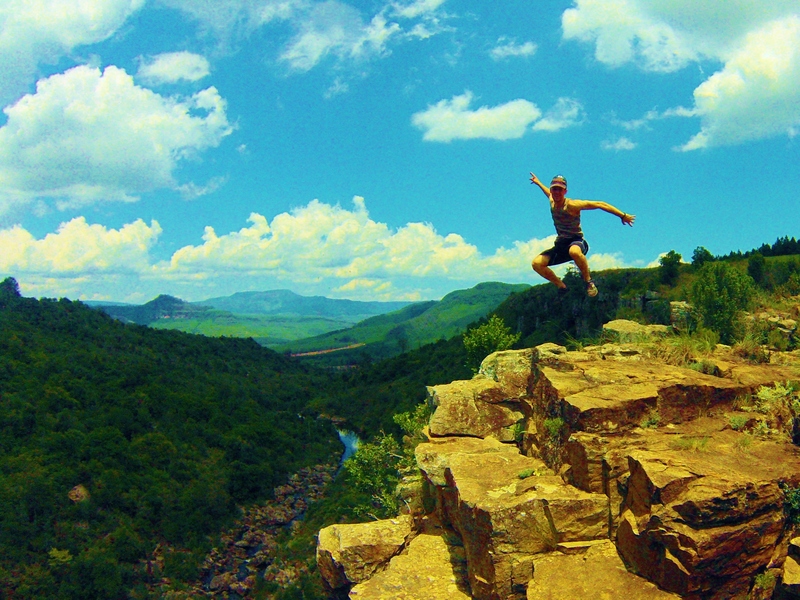 Hey my name is Ed and I wanted to write down my experience in South Africa. It makes things WAY easier on me because everyone back home asks the same question: “How was Africa?” I don’t want to simply say, ummmm its really cool. Africa trip deserves more than just an short elevator ride description. So on my flight to there, I was exhausted. This guy here is a procrastinator. I ended up packing past midnight the night before my trip. The flight really sucked! I sat next to this ‘Oak’ (that’s how they say ‘big guy’ in SA) who took both of the arm rests. Can you believe that?! The nerve! After a long 16 hour flight I had nasty headache. But at least I got to see the new Bourne Legacy on the plane which was pretty awesome. The SA airport is huge! It was really modern which surprised me. I expected it to be less sophisticated. The joke was that we would land on a dirt runway and have to make a run for the cars before the lions got us. We finally got our stuff intact. I was SO worried that TSA would steal my rock climbing gear and not give it back. But it was all there so I could relax a little. We met Alla for the first time in a year. She looks great, young and beautiful like always. It was nice to see a familiar face. We got into her car which was kinda weird. Her steering wheel is on the right side. Everyone drives on the left side of the road which takes some getting used to. Driving from Joburg to Pretoria is freaky. I mean there are all these people standing around the streets doing nothing. Its really dangerous when you stop at the stop signs because people here can run up to your car, smash your windows, and then to get the items on the seat or simply rob you. Keep your doors locked at ALL times. Alla had several instances when guys would try to get into her car at the street corners. Luckily for me I was armed with a tiny pocket knife, so I felt a somewhat secure. That was just some of the info that Alla gave us on the drive to her house. Her housing complex is really nice. There is a finger print scanner at the front gate. The whole neighborhood is surrounded by a 100,000 volt electric fence that sits on top of a 10 high brick wall. Alla calls it her ‘estate’ because that’s the word for neighborhood in SA. We gave her a hard time because only the wealthy have ‘estates’ in the US. Next place we went was out to a restaurant and got some killer steaks. Everything tastes so much better here because it’s all organic. The premium steaks were only $10 US which was awesome. We then called it a night. So today is December the 21, the end of the world. But apparently the Mayans messed up because they are gone and I’m still here. I woke up this morning at 2:00 am and couldn’t go back to sleep, my whole sleeping cycle was messed up because SA is 7 hours ahead. So I did what any normal person would do in my circumstance, I went downstairs and exercised. After like 2,000 pushups and 5,000 situps (I know, I’m a beast!) I got pretty hungry. There was plenty of food in the fridge so I cooked some eggs and toast. Half way through the meal I realized the bread was a little moldy. Consequence of no preservatives. Oh well, I needed my dose of penicillin. Later on in the morning Al and I went for a jog around Alla’s ‘Estate’. She said that the circuit was around 3 miles around the whole estate. Well, she was wrong. It was more like 4 miles! The extra mile sucked under the African sun. Al and I chased this big bird and a rabbit on the run. Why? Because we could and it was awesome! While we were running under the scorching sun, a lady stopped us and told us that it was unacceptable in SA to be seen public without a shirt. Who knew? I haven’t been here for even 24 hours and I’m already breaking rules. 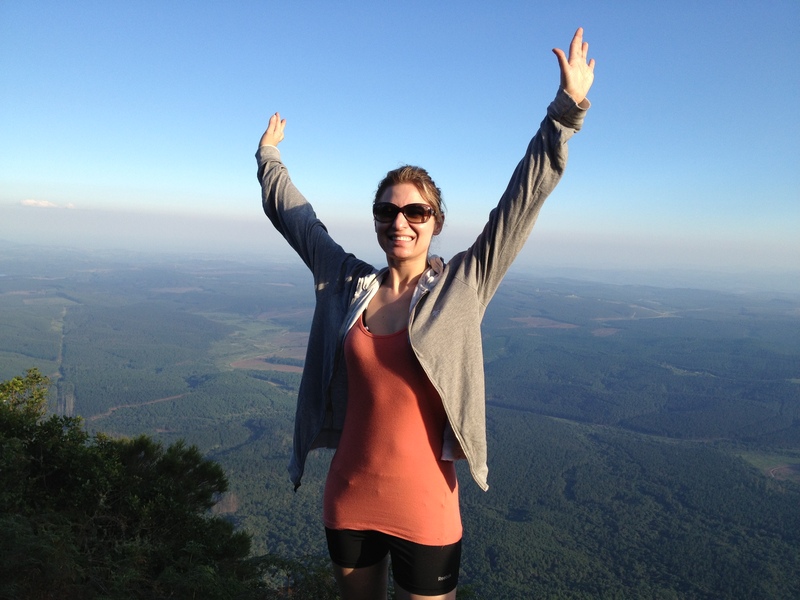 We headed out to Kruger National Park after our run. Kruger is like the size of Rhode Island. The 5 hour drive was terrifying! I almost died a few times because of Alla’s driving, sorry sister but I’m calling you out! Everyone here has only one thought on their minds when driving: “I wonder if I can pass the car in front of me during the upcoming blind turn…” Who does that?! 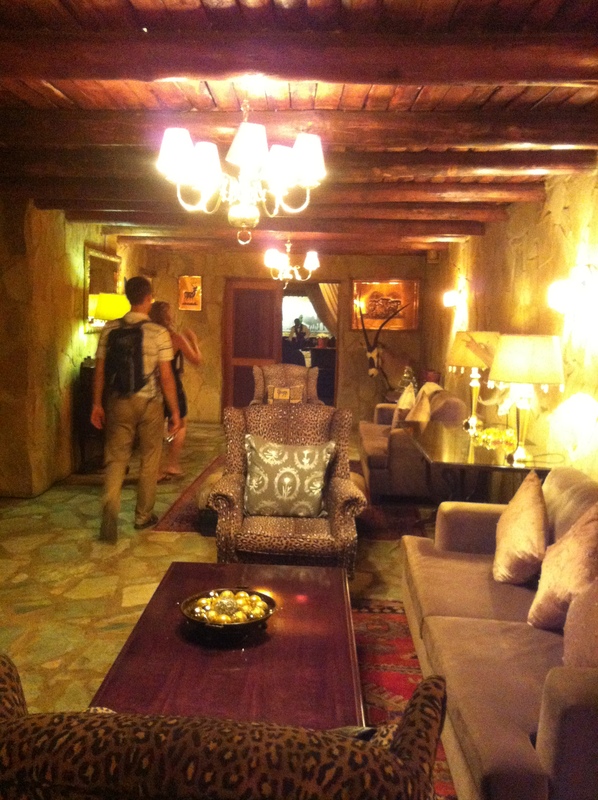 We finally got to Kruger Hotel safely. It’s right at the entrance to the park which was really convenient. The hotel is super cool. It has this huge deck area with a roof that connects all the buildings together. It’s like a giant log cabin of sorts. 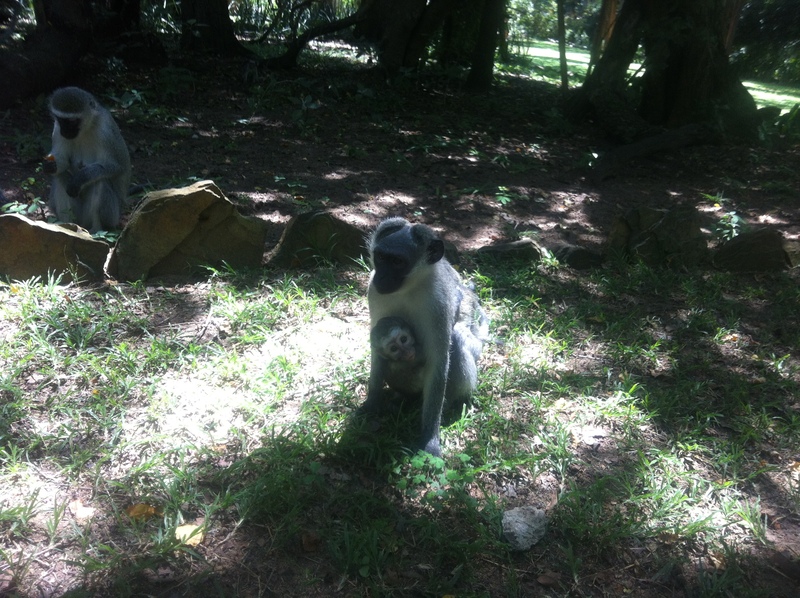 There are so many monkeys out there! Be careful feeding them because when you feed one, all of them come running at you for food. The staff is friendly and customer service was great. These guys feed you with a delicious breakfast and dinner. I wish I could fit more of it into my stomach but I about exploded every time I ate there. However, all good things must come to an end. A mosquito bit me on my forehead!!! I can’t believe it! I took so many precautions: DEET Spray, sneakers, jeans and a jacket in 75 degree weather…. and I still got bit! Now my only hope is anti-malaria meds that I’ve been taking. Kruger area has a high case of Malaria. 12-22-12 We woke up really early; 4:00 am to get ready for the safari at Kruger. You have a choice of using a guide but we opted out because Alla has been here before. She claims to be a self appointed expert. The three of us got into the Toyota Corolla and took off. The entrance is paved into the park but later on there are dirt roads that branch of every which way. All roads are clearly marked so it’s pretty much impossible to get lost. 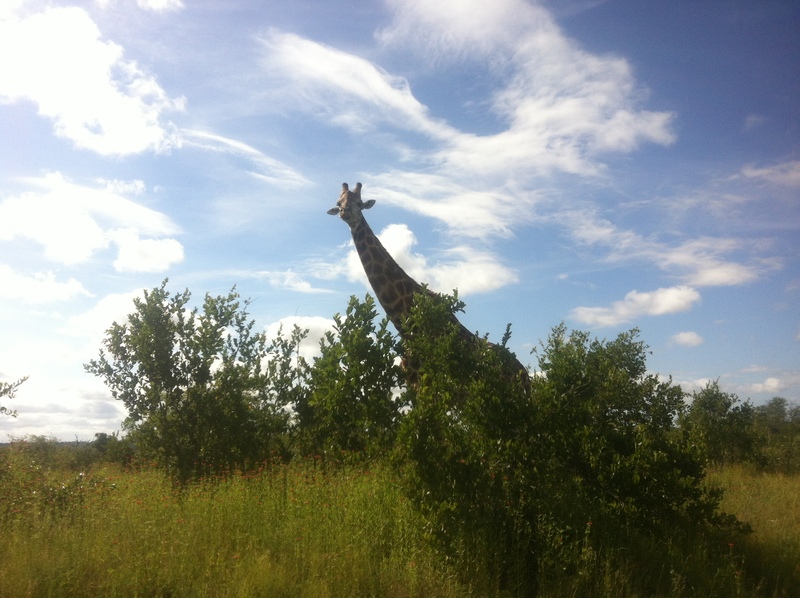 We saw a few animals; Zebras, tons of Empalas, deer, a few Giraffe, Kuzos , a rabbit and a random water bird (Alla said rabbit/bird doesn’t count). We were looking for the Big 5. They are the elephants, rhinos, lions, water buffalo and leopards. After hours of searching and seeing 0 of the Big 5, we called it a day. This place is huge and it’s a hit or miss kind of thing. But after talking to the locals, we found out that we are the unluckiest American tourists ever. Apparently EVERYONE sees at least one of the Big 5, but we didn’t. Our expert guide failed in the area of the Big 5. No tip for you Alla! Oh well, next time I’ll put away my camera and come back with a rifle, JK. We came back to the hotel and grabbed some food. I had this omelet which was really good (Mom’s omelet is still the best!). They always have a bunch of fruit you can eat and these awesome freshly squeezed mango juices. I really could get used to this! We got some sleep afterwards. Al wasn’t feeling well. He had a fever. I thought he was coming down with the case of Yellow Fever or Malaria or some other crazy African illness, but he turned out ok. That night while we were eating outside next to a firepit. There were these guys that came out and danced for everyone. They were wearing traditional African clothing (which wasn’t much clothing at all) and danced to these drums. It was pretty cool! 12-23-12 I woke up at 2:00 am again! It happens to me every single night which throws off my whole day. Since I couldn’t sleep I decided to capture the sunrise with my GoPro time lapse feature. While walking to the viewing area I came across this GIANT Spider. It’s body was a couple inches long, not including it’s crazy long legs! I’m not even exaggerating his size. I busted out the camera to show the world my discovery but this guy started to chase me!!! That was the fastest bug I’ve ever encountered but no worries, I ran like a coward and got away. The sunrise was unreal. 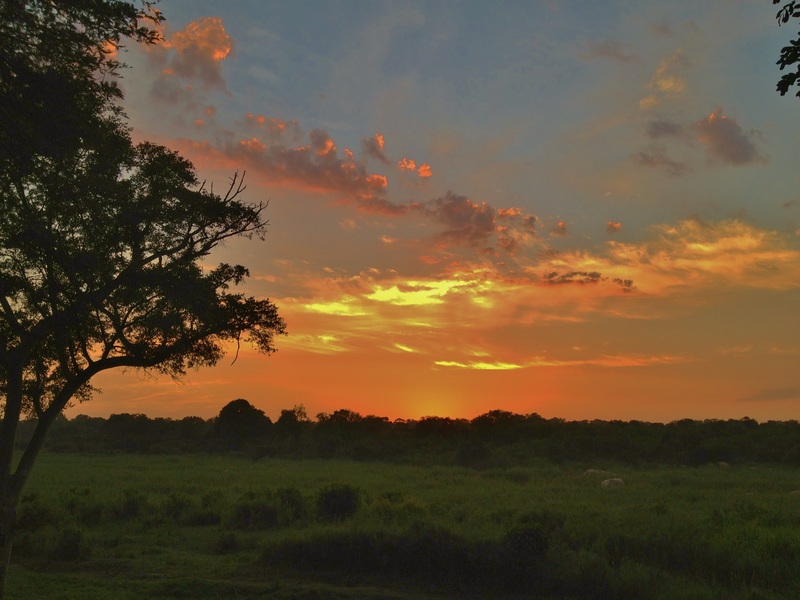 As the sun slowly creeped over the tops of the trees, you could hear the Lions and Hippos at the river in front of us. There wasn’t much to do after that because the sun rises early- 5:30. Al woke up so we went down to the pool to mess around with the GoPro’s underwater features. We were filming gainers, backflips and dives. That’s about the time when I busted by head open diving. I was SO mad at myself. I thought I was past that stage of pool injuries. Get this, the gash was started right below the hairline in the center of my forehead and went straight up. It did not look pretty! I didn’t let Alla see it because she would Freak Out. The baseball cap did a great job of covering it up. We were leaving in the morning anyways so I told them that I need some stiches. The executive decision was made to stop by Nesbrut Mediclinic which is a private hospital, only after eating another filling breakfast of course. We packed up, ate breakfast and then drove 1.5 hours to the hospital. This Doc named Alyson stitched me up really well. You can barely tell that I messed up my head. We then headed over to Protorea and dropped off our stuff at the hotel. There is this place called God’s Window nearby that has this amazing panoramic view of the SA. It was really neat to see Africa from up high. On our way back we stopped by this Portugese based restaurant which turned out to be loads of fun! Alla said she wouldn’t respect me as a man until I ate a ton of this greenish hot sauce. That sauce was ridiculous! It about killed me when I caved in to the peer pressure and ate it. Thanks Alla! The drive back to the hotel sucked because there were loads of random potholes in the road and they are so hard to see during the night. Thankfully we didn’t hit any of them and made it back safely. 12-24-12 We woke up at 7 in the morning when it was supposed to be 5:30. Come to find out, these guys decided to sleep in and use me as an excuse. They said I need to sleep longer due to yesterday’s injury. I was like ‘Sure, blame it on me.’ But I couldn’t complain because we haven’t been sleeping much on our vacation. We stopped by the souvenir shops at God’s Window. 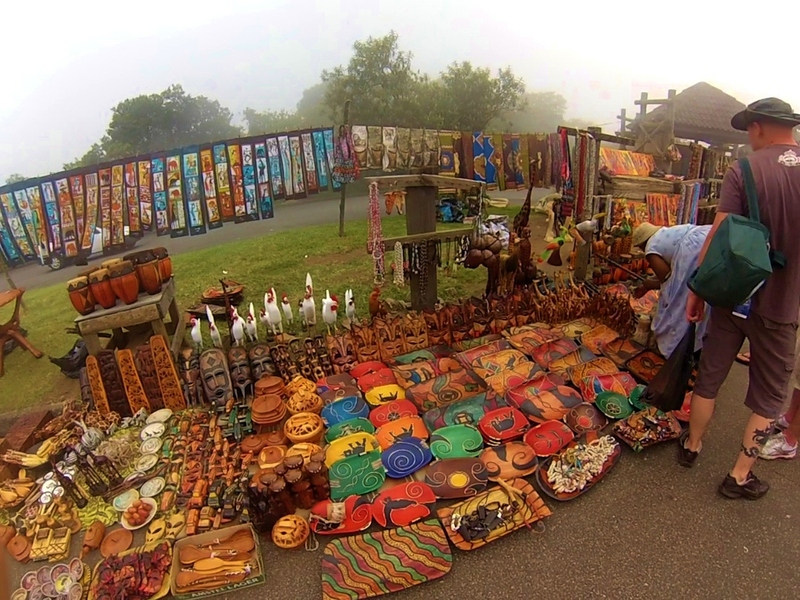 They sold tons of neat items carved out of wood. It was fun to bargain with these people. They wouldn’t drop the prices past 30-40% because apparently EVERYONE is trying to get their kids through school… sure. 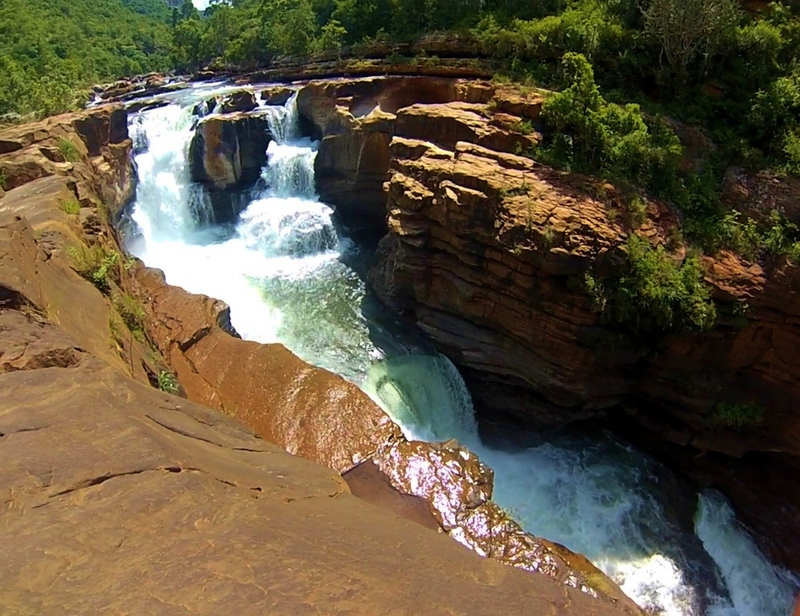 Afterwards we headed off to Blyde River canyon. It’s the 3rd largest canyon in the world. 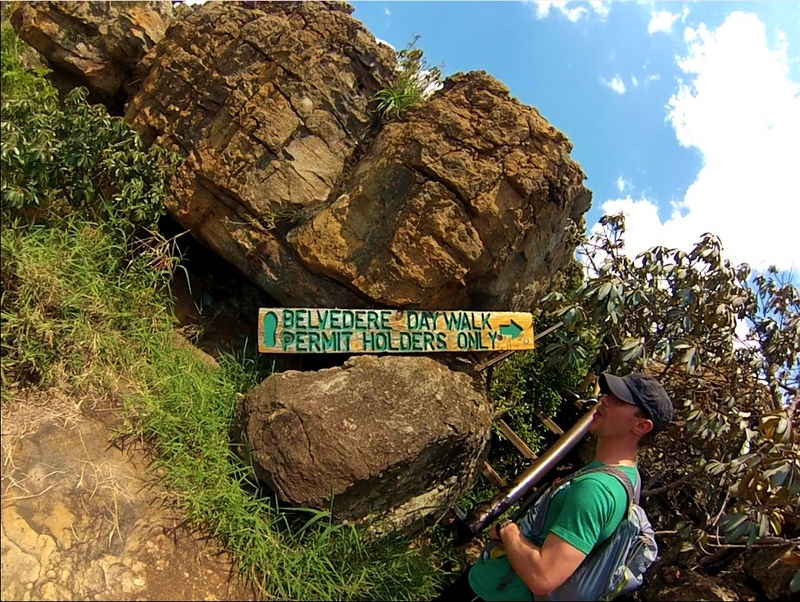 We choose to hike the Belvedere Trail which was supposed to lead us to the isolated Dientjie Waterfall. So we arrived around noon and started to hike the trail which takes roughly 2.5 hours each way. The trail is CRAZY steep and really rough terrain. I’ve hiked many different trails back in the States but nothing like this. It took us right into the depths of the canyon. It was well marked though with green paint on the rocks. After hiking 2 hours Alla couldn’t go any further. Her shoes were too small and they were crushing her feet. Apparently they shrank because she washed them right before the hike. I was wearing my NewBalance Minimus shoes. These things perform like no other shoe due to the minimal sole that is flexible but tough. Al decided to run up ahead, get the waterfall on footage and double back. I decided to stick with Alla and walk her back to the Trail head. Alla made it back just fine after I cut up her shoes with my knife to make room for her toes that were being squeezed. However, something was wrong. Al didn’t show up at the rendezvous site at the set time. So I grabbed some water, a couple of oranges that we had and ran back down the trail looking for the guy. I was really worried because he is allergic to Bees and he had no antihistamines with him. After running near the waterfall and not finding the guy, I ran back to Alla because it was getting dark and no one needs 2 lost hikers. When I got back to Alla, Al was there! I couldn’t believe it. Come to find out, Al stepped off the main trail and was running around the canyon in the bush lost. He did get back on the trail eventually and made it back. Al was kinda messed up! 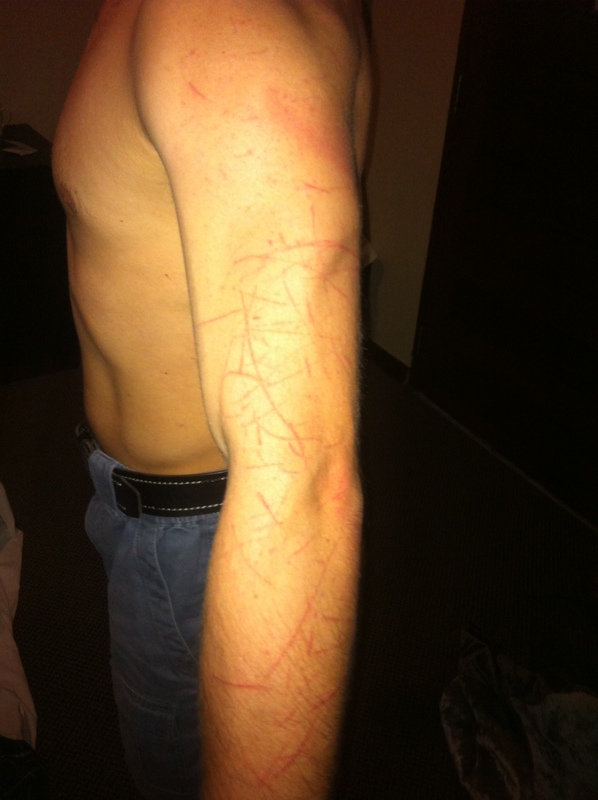 There were crazy scratches on his arms and legs everywhere. There was also quite a bit of blood running down his legs. Looking back at the events I guess I must have passed him at one point when I was searching the trail. It was my fault for allowing the group to split up. Never again! At least he made it to the waterfall and was able to show us pics of it. Looking at the map, I must have hiked around 6 miles with Alla and ran 7-8 miles looking for Al. It was cool though, I needed the exercise. Alla had it the worst though. When she was waiting for the one man search party (me of course), she made the outrageous mistake of feeding a monkey with a nut from her trailmix bag. A British Man saw her performing this unthinkable act and yelled at the top of his lungs “She’s FEEDING the Monkeys!! !” He got the security and told on her! Can you believe that?! The security could care less but did ask her not to do it again. Alla was SOOO mad at the guy haha! When we all got back to the hotel to crash after our big day, I found a GIANT frog on my bed. No joke! This guy was the size of my palm. I was like, Really?! Because yesterday there was a long lizard, about 5 inches long, next to my bed. Why is it always my bed? This is Africa, what else can I say? 12-25-12 We woke up really early on Christmas morning to pack up and get back to Pretoria, about 5 hours away. Poor Alla got destroyed by mosquitoes last night in our room. Al and I were untouched because they know better. We had breakfast which was awesome like always except that the waiters are slackers. Seriously! After sitting at our table for 5 min, Al had to go and find our waitress. She was reluctant to get our drinks. In all honesty, many S. Africans are extremely lazy and take no pride in their work. It’s common to find this attitude everywhere because its part of their culture. I drove us back to Pretoria, a long 5 hour drive. It was hard getting used to because the driving lane is on the left side and the steering wheel is on the R side of the car. It kind of messes with your mind especially when making turns. I was speeding because there was nobody on the road. No people or cops anywhere which was great. Luckily there weren’t any cops in the bushes either. These guys sit in the bushes on a lawn chair with a cooler next to them. They have this HUGE cannon looking camera that they use to take pics of license plates, if your speeding of course. Then all they do is send you a ticket in the mail. When we finally got home, the internet was still out. It really upset Alla because she wanted to skype with her family. There was a hotel near by called The Farm Inn which had internet so we headed over there. This place is the ultimate man cave. The whole place is made of rock and logs and has this very rustic feel about it. 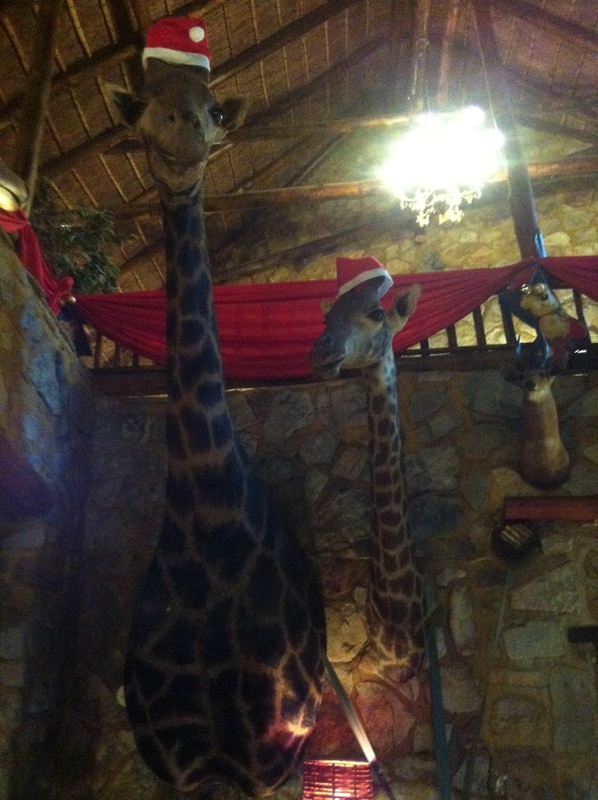 There are taxidermy lions and giraffes everywhere which was way cool. There we met up with Alla’s co-worker Patrick. He is easy going with a great sense of humor. After skyping with the family we all headed back home to prepare Christmas dinner. I grilled steaks and chicken kebabs which turned out awesome ‘if I may say so myself.’ Alla made some delicious Malva Pudding with this custard sauce that was out of this world! Seriously! Al got the privilege of decorating the cake which ended up looking like it got man handled. It still tasted good though! All the food went to Pat’s house for the dinner. There we met two local South African girls. The have the neatest accent. Its like a mix of Australian and British. Pat was trying to prepare ham and needed some help. He has this super high tech oven that has all these buttons. After putting our brilliant minds together for 5 minutes, Al Pat and I found out how to turn it on. It took another 10 minutes of pushing random buttons before the thing was actually working properly. It was fun learning the African culture from the young ladies. They said Americans tip WAY too much at the restaurants, who knew? The Christmas dinner was composed of the most random young people and it was loads of fun! 12-26-12 So Pat decided to join Al and I on our lion adventure to Ukatula. We got there mid afternoon and the 1.5 hour drive wasn’t too bad. As soon as we signed our lives away on the waivers we joined up with a group of people and saw the Little Devils. There were about 12 young lion cubs around the 3-5 months of age. It was super awesome to get in the den and play with the cubs. One of the little rascals bit my thigh, it hurt like crazy! Luckily my skin is part steel so those razor sharp teeth didn’t draw any blood. You really have to be careful with them because they chew on EVERYTHING! A volunteer there, yes you can volunteer at this place, showed me one of his wounds. It was insane! And I thought my head injury was bad. The guy was messing with the 1 year old lions when one of them got too playful and got him with its claws. He has a nasty injury on his stomach but at least it’s an epic story to share with others. 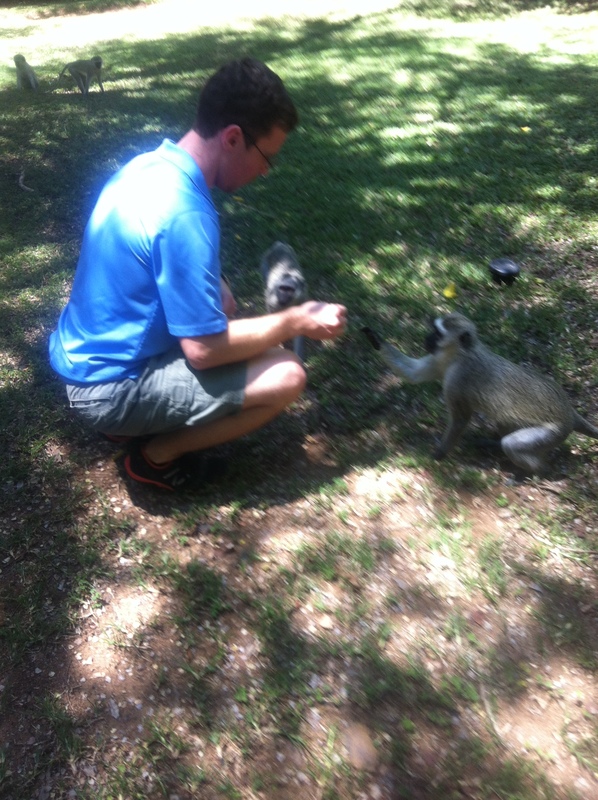 Playing around with these cubs was the highlight of my trip. I wanted to smuggle one of the little guys out but my backpack was too small. Mufasa would have made an awesome souvenir! We got to see a bunch of adolescent lions that were 1-3 years old. They are adults when they are 6 years old. 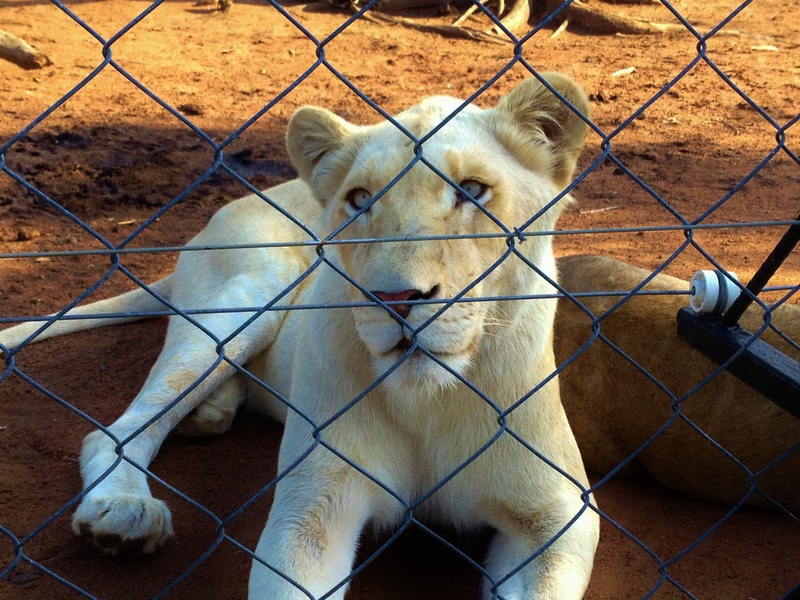 The park specializes in breeding white lions. These guys have these very intense blue eyes that can stare right through you! I tried to have a starring competition with one of them but lost. We also saw some Lynx and a Cheetah called Emma. She doesn’t like men, what’s up with that? She only lets the ladies pet her. That’s alright because lions are way cooler than cheetahs. At the end of the day we got a chance to walk with 2 young lions. They were 1.5 years old and stood about waist high. The 2 lions were running around us while we walked through the bush. Did you know lions can climb trees? I saw them climb trees like it was nothing which has messed up my whole lion evasion plan. I planned to climb a tree if I ever got attacked. The guide said it’s best to stand your ground and bluff them… Yea right! I’m sticking to my plan. All I have to do is climb higher than it. We called it a day and drove back to Pretoria. There was an insane rainstorm on the drive back. It is either hot and sunny or it’s hurricane weather in South Africa. Not much happens in between. 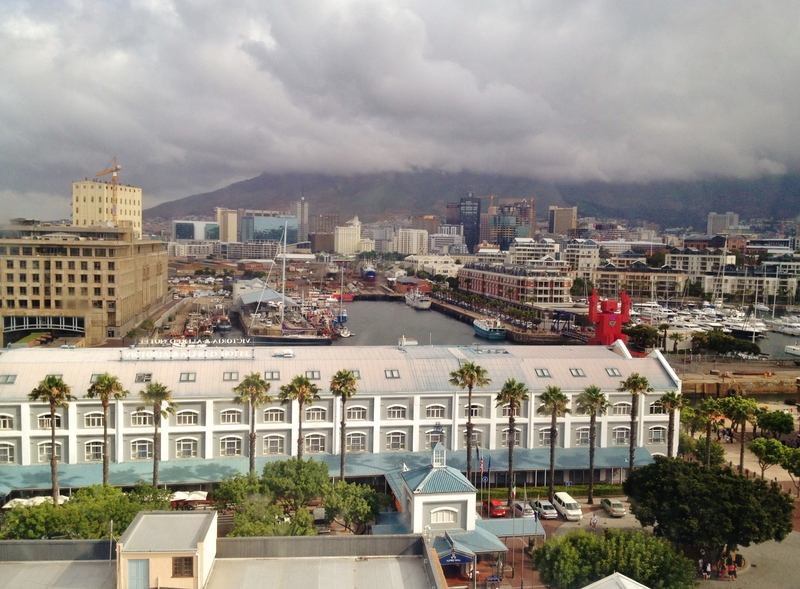 12-27-12 Our goals for the day were to get to Capetown, rent a car and get to the hotel. I was forced to wake up super early in the morning to pack up and get ready. Breakfast consisted of 2 small slices of cheese pizza which was not enough to get this body moving. The 2 hour flight there was one of those memorable ones because it basically sucked. There was this guy sitting behind me that was constantly coughing with his mouth open. I also sat in the back of the plane near the toilets… I’ll leave it at that. Alla rented us a Nissan Livina. It’s a four door car that we don’t have in the states. I liked it because it was manual. Driving a manual with the left hand was kinda cool. We drove straight to the V & A Waterfront in Capetown to get some food. Fuel for the body was the number one priority. All of us were pretty much like grumpy zombies because of hunger. Hunger can make you irritable sometimes. Traffic didn’t help at all because it took forever to get there. There were like a billion tourists everywhere! We finally found a restaurant that served seafood. Capetown has AMAZING seafood and sushi. Everything here is so fresh and preservative free. They have these local markets at the Waterfront that serve excellent food. We ate some crepes covered with condensed milk with nutella inside them. We got around to checking in to St. Georges Hotel. It’s supposed to be a 4 star hotel but its more like a 3 star by US standards. They have no small fridge inside, the TV’s are those large tube screens from the 90’s, and they serve the exact same breakfast every morning with no dinner provided like at Kruger. Oh well, us Americans are simply high maintenance I guess. At least the hotel is directly in the middle of Capetown and the customer service was excellent. Later on that night we headed out to Wakame Sushi Bar. If your ever in Capetown, go there. The sushi there is outstanding! 12-28-12 We woke up at 6 to go hiking at Table Mountain only to find out that it’s closed because of cloudy weather. They close the mountain to hikers because it gets really dangerous. When the clouds cover it, you can’t see anything. Imaging the worst fog you’ve ever encountered and multiply it by 10. The clouds here seem so much lower in elevation for some reason. Gravity must be stronger in Capetown or something like that. Alla came across a mountain biking place online called Downhill Adventures so the day was not a failure. We met up with the manager called Jerry who hooked us up with bikes called Giant. Jerry is an easy going guy who has traveled the whole world and ended up sticking around Capetown in the end. It says a lot about this place. After he dropped us off part way up Table Mountain the three of us took off down these difficult gravel/sandy trails . They were really hard to navigate because of the terrain. Poor Alla had a hard fall in the very beginning. She was trying to keep up with the boys and ended up wiping out. But no worries, she tuffed it out. It was so hot out there! Alex applied sun block but missed these large patches on his arms and shoulders, he burned pretty bad haha! The trails finally ended and we got on the steep paved streets. That was the highlight of the biking trip because no work was required of my massive quads. Exploring Capetown on the bikes was awesome because we simply weaved through the traffic. Alla took us to Bo Kaap. It’s a bunch of streets that have these really colorful homes lined up. There is a small restaurant there called Caas Café. Put it on your list of places to go. After all that biking, we rested up at the hotel and then headed out to Lake Side Pinnacle to do some rock climbing. The drive was like 30 minutes which wasn’t bad at all. We did a few sport routes which were super neat. 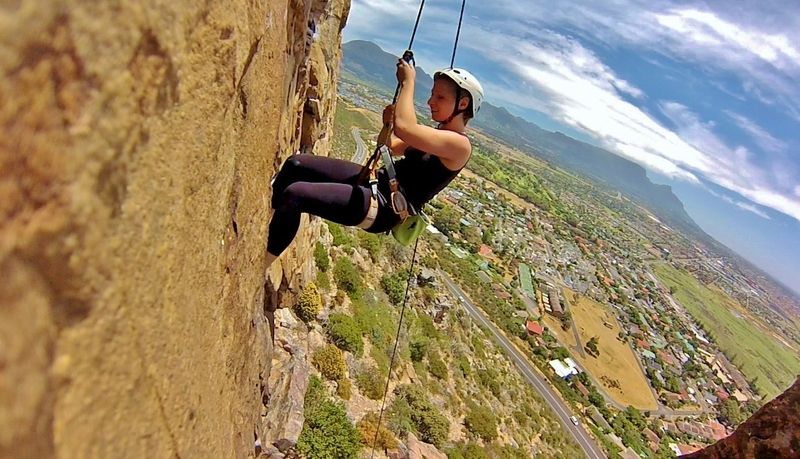 These single pitch sport routes overlooked Capetown with Table Mountain in the background, the view was simply incredible. Alex couldn’t finish one of the routes there called ‘Who Knows?’ It was like a 5.10 or so. Too bad his MBS couldn’t help him (Massive Bicep Syndrome). When it got dark we drove down to this Thai place that was run by a family. They simply converted their home into a restaurant. The food was great like everywhere else we have been. I forgot the name of the place because my brain was mush by the end of the night. 12-29-12 Everyone was so tired from yesterday that we choose to sleep in till 7. It was a late start but I needed the extra hour, I was running out of steam. Too much to do with so little time. 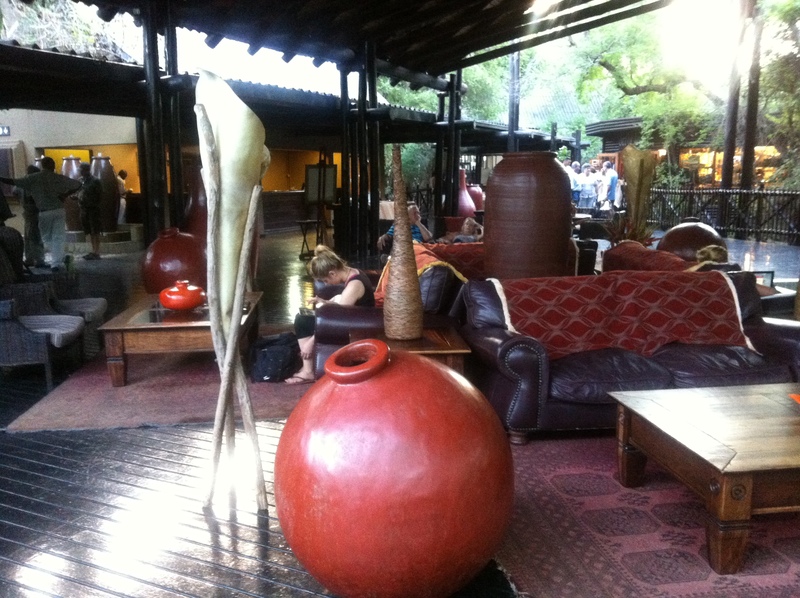 The day’s agenda was to drive around and explore major areas of South Africa. I drove because Mountain biking beat Alla up. She was all bruised up. We drove to Stellenbosch first. It’s supposed to be the wine capital of the world. A lot of those vineyards are hundreds of years old. Everyone acts so sophisticated at those wineries. They swirl their wine around, stick their noses into the glasses and then use exotic adjectives to describe the wine ‘spicy, smoky oak, fruity, woody…’ I was like “sure, if you say so.” I don’t understand wine nor like it in any way. If you ask me, I say juice complements red meat the best. The wine making process is pretty neat though and the experience was a lot of fun. We then proceeded to drive south to Simon’s Town. 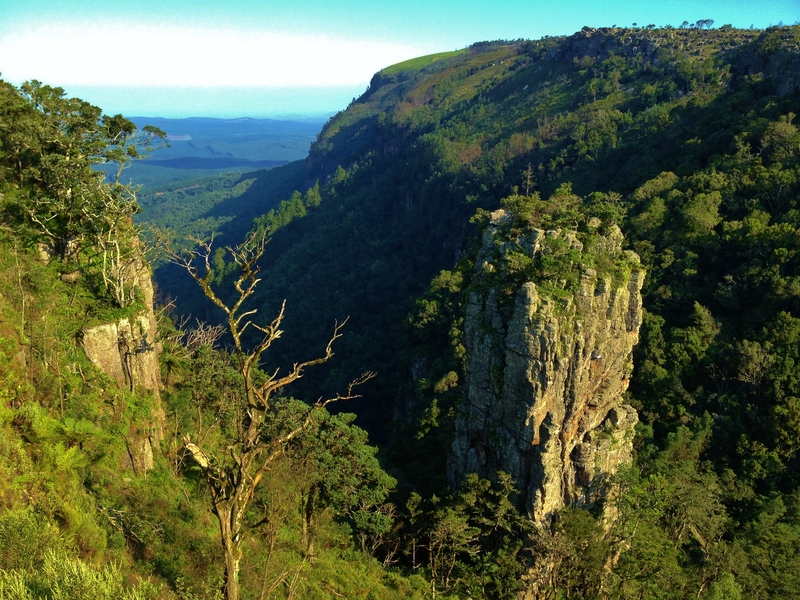 It’s a small tourist town nestled among the cliffs overlooking the Indian Ocean. Alla loved that place but driving through it was horrible. There were tourists like us everywhere! 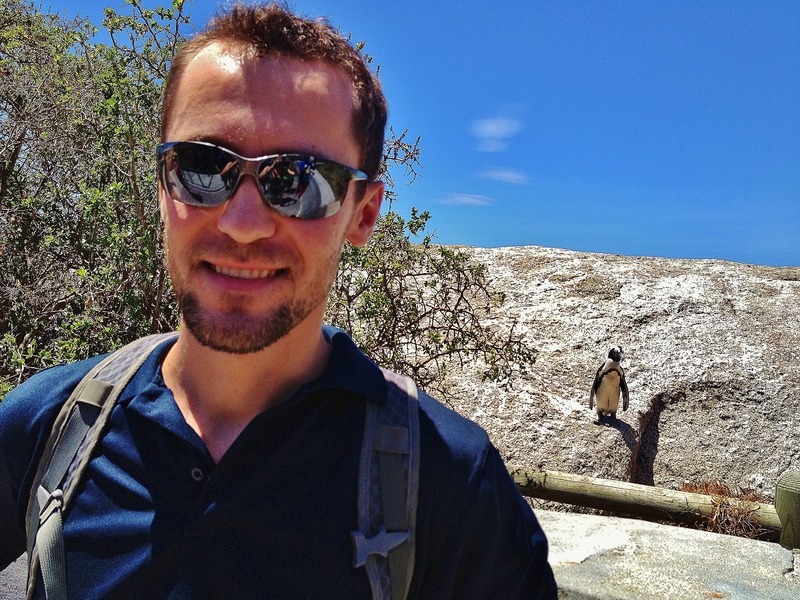 After we ran down and touched the Indian Ocean just to say that we did it, we headed down to the Penguin Colony. The atmosphere here isn’t as up beat and energetic as in Simon’s Town. We walked around and came across some legit penguins in the wild. Al got a pic with a penguin while wearing Andrey’s sweater which is made by Penguin Co. I thought that was pretty cool. For those that don’t know, Al jacked the sweater from Andrey and has been taking it all over the world. 12-30-12 Al and I woke up at 1:30am to get an early start. I think I’m losing weight from the lack of sleep. Oh well, I’ll gain it back in the States. 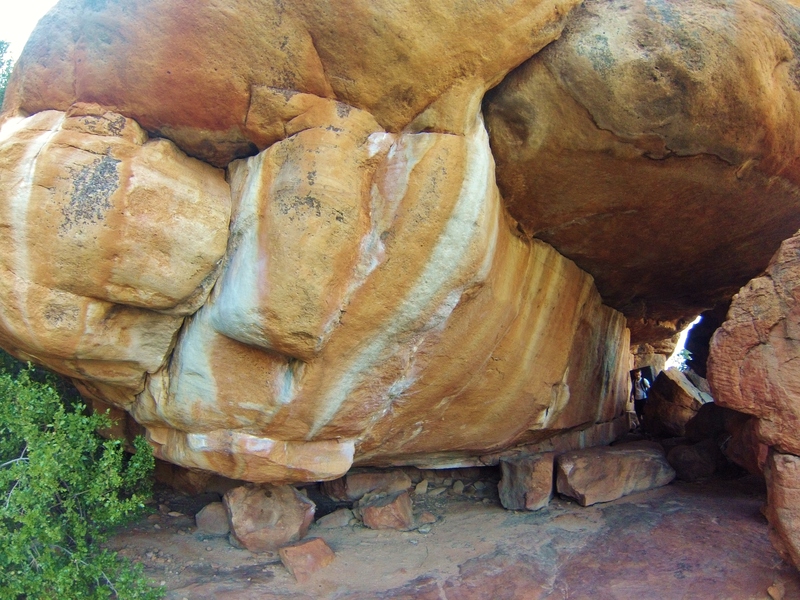 Our plan was simple, get to De Pakhuys place, get crash pads and go bouldering. Alla stayed behind. She wanted to do girly stuff like get her eye brows plucked and stuff. Sounds like torture if you ask me. The drive to the Rocklands is 2.5 hours long. We got to Pakhuys place only to find it closed on Sunday. What a bummer! But all was not lost. Al saved the day by doing the unthinkable. He fiddled around with the multidigit lock pad and got it open! We grabbed the crashpads, left behind a note with money and took off. There was a camp ground at the entrance to the bouldering areas. A guy gave us some pointers to the places we should see and climb. These guys have it all figured out. Here they are chilling out and camping at the doorstep to the greatest bouldering in the world. They climb in the morning and evening and rest during the hottest part of the day. When it’s scourching outside they simply hang out under the shade of the trees, read books, play music… you get the point. I may have to join these guys sometime. Bouldering was unreal! Every rock face is so unique and the features are amazing. We tried a few different grades but ended up mainly sticking with V3-V4 routes. Most of the rock here is very rough. If you know 60 grit sandpaper, it’s kind of like that. I was burning up a t 8 am and had no sunblock. By the afternoon I was totally cooked. That’s ok though, I hear the more sun you get, the better it is for you. It was too hot by noon and our hands were sore from the rock so we took off. Our stomachs led us to Clanwillian. It’s the nearest town to the Rocklands with only 1 restaurant there. The food was mediocre to say the least. Their largest meal consisted of a piece of bacon, burnt piece of toast, and only 2 eggs. This man needs at least 5 eggs to keep himself going. These guys are not helping my weight issue one bit. So far, that has been the most disappointing meal yet in SA. The drive back wasn’t too bad. I came across only one cop sitting in the bushes with that giant camera. I think he took a pic of me because I was speeding 15 over when I saw him. The ladies we met over Christmas dinner told us that everyone disregards speeding tickets in the mail and never pays. After we got back everyone was feeling sushi again. I ordered this new style sashimi which was really good but only enough to feed a small field mouse. Alex saw me eyeing his plate and was kind enough to share, thanks buddy! We then hung out at the Waterfront. There were loads of people there from all over the world. The live music was fantastic! The guys on stage really know how to put on a good show. Al really wanted to capture the sun setting over the ocean so we headed to the beach. He set up the GoPro but the wind was way too chilly today. Alla and I sat in the car while Al froze outside haha! Great way to end the day if you ask me. 12-31-12 The plan today was to go cage diving with the great white sharks but that fell through. All the cage diving tours have been closed the whole time we’ve been in Capetown. The wind has been really strong with gusts up to 70mph. The ocean was really rough and all the sharks were gone. Unfortunately with the wind being so strong, we couldn’t do paragliding either. That would have been SOOO awesome to paraglide off Table Mountain. Oh well, some times you can’t have it all on vacation. Like they say: “When in Rome…..” lol sorry it’s an inside joke. Alla wanted to rock climb again and Al wanted to conquer his route so we headed over to Pinnacle. It was so much fun because we hit up all these major routes that we couldn’t do last time due to time constraints. Alla was tearing it up! Seriously, for a first timer on real rock craigs, she did great! Al finally completed his route and was super stoked. The sun was right over us the whole time but Alla and I were unaffected because we used sunblock SPF 1000 or something like that. Al wanted to work on his tan so he opted out. After hours of climbing, Al turned into a lobster haha! Ok, he burned before when mountain biking but this just didn’t compare. Poor guy couldn’t wear his backpack anymore from the pain. We rested up at the hotel and then headed over to the Waterfront to spend New Years there. After walking around aimlessly we finally found a spot to settle down. Cafe Grace was the perfect spot because we got to sit on these couches on the deck near the ocean. There were these heating lamps directly over us which pretty much kept me alive. Alla was all bundle up with blankets that the Cafe provided. It got super cold because of the wind but I survived with the help of hot African Rooibos tea. The fireworks show was pretty cool even though it was only a minute long. The fireworks traveled sideways when they exploded because of the strong wind. The wind changed the dynamics of the show which was pretty cool. Alla and I headed back later on but Al stuck around because he made a new contact named Willy. The guy owned a mining company or something along those lines. Spending New Years outside in the cold was unique and definitely worth every moment. 1-1-13 I woke up all refreshed and energized which was rare. Al was a zombie this morning because he got back around 3 in the morning and only got a few hours of sleep. Alla was in rough shape. She had an allergic reaction to something unknown and was itching all over. I gave her a couple of antihistamine pills which pretty much knocked her out. Today was our last day in Capetown and our check out time from the hotel was 10:00. Our flight didn’t leave till 8:00pm so there was a whole day ahead of us. Al and Alla were pretty much bums because both wanted to sleep. I drove them to a wildlife park next to highway M3 and parked the car. Those to slackers just slept in the car while I went out and explored the park. This park has miles worth of trails which are really neat to run on. Later on I took them to the airport where they continued to sleep for a few hours. The flight back wasn’t too bad overall. 1-2-13 Today was our last day in South Africa. Alla was really sad at our departure. We said our goodbyes, Al gave her one last wet willi which she wasn’t too happy about lol and then we flew off. The 16 hour flight back was awesome because I sat next to these two guys who gave me loads of info on backpacking and traveling overseas. I am excited about my next adventure and hope to share it with everyone soon.